We own a 34 year old home with window wells. They are filled with gravel and plastic drainage pipes, hopefully leading to the weeping tiles. Every spring, or during a heavy downpour, our window wells do not drain properly and fill up to the point of water seeping through the windows into our basement. Some people have told us that perhaps the drains are clogged with dirt or debris. How can that be corrected without a whole bunch of expense? Can we do it ourselves or do we have to call in the expensive "big guns"? Problems with window wells filling with water after heavy rains are a common complaint of homeowners. Too often, the blame is mistakenly put on the fact that these essential landscaping components are present. The window wells, themselves, should not be the focus of concern, but lack of proper cleaning and maintenance, or improper installation originally is often to blame for waterlogged wells. 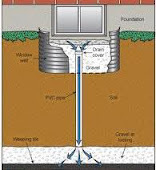 Window wells are installed on the outside of foundations primarily for one reason, and one reason only. They are installed to prevent moisture damage to basement windows, and sometimes other components, which are at or below grade. If the window wells were not present, the soil up against the exterior of the house foundation would be as high, or higher than the bottom of the window sill. This would allow the soil and the window frame to make contact, which is always a recipe for disaster, especially with wood windows. The window wells keep the soil away from openings in the foundation walls, while still allowing proper grading and drainage away from the house. In homes of your age it was common practice to install plastic drains in the soil inside of the window wells. These plastic pipes normally empty just above the weeping tile, near the bottom of the foundation wall and footings. While this seems like a good idea, these may create the problems you are experiencing when blocked or improperly installed. Too often the soil in window wells has settled or was excavated too far below grade and filled with crushed limestone or other drainage stone. The vertical drain pipes inside of these areas are typically filled with stone, as well. The combination of these two factors is the likely cause of your problems. Any time our clay soil is excavated, to dig a trench or depression, the lower area created is an ideal area to collect water from snow melt runoff and rain. This is primarily due to the nature of the clay soil, which will slowly absorb water and allow the excess to run to the lowest point. That is why we often see standing water in only the lowest areas of yards and why good grading around foundations is critical to maintaining a dry basement. With sandy soils or stone, such as that in your window well, this may not happen. This stone may allow good moisture absorption in the spaces between the granular materials. That is why the window well drains are often filled with stone, to allow good drainage to the weeping tile. The stone is normally installed only in the top section of the window well, with normal clay backfilling in the area below. 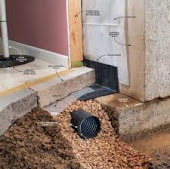 The problems occur in this type of system after many years when the soil erodes and settles around the foundation and the drains become blocked with soil, leaves or other debris. The drainage stone, which previously only filled the top of the window well, may have settled beneath the bottom of the metal window well, allowing an ideal area for water to settle from the surrounding clay soil and runoff. This gravel layer will often allow water to seep inside the window well, performing exactly the opposite function that it was designed to do. This water should normally exit the area, before it fills, via the drainage pipe. If this pipe is blocked with soil, debris or other material, it will not drain and the well will fill with water and create the problem you are experiencing. This can also occur more rapidly if the metal well barrier is installed too deep or has pulled away from the foundation. The solution to your situation is to initially clean out the drain, but this may not be a permanent fix. The bottom of this pipe may be inaccessible without major excavation and may be completely blocked or no longer properly draining to the weeping tile below. In this situation, removal of the pipe, the metal window well barrier and some of the soil and stone in the area will be required. Once this is completed, a new metal well barrier may be installed and secured to the foundation and the clay soil refilled, with a new drainage pipe, if possible. This may be a job you can initially handle your self, but will require some heavy digging and hauling. If the metal window well has pulled away from the foundation, a masonry drill and bit will be required to re-secure it or install a new metal barrier. If too much stone has been installed, deeper excavation will be required. 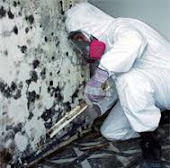 If the job appears too hard to for you to handle, most foundation contractors do window well installations and repairs. This article is written by Pierre Van Belleghem who’s with Aquaseal Basement Waterproofing Contractors. 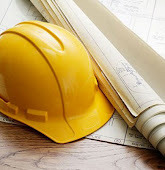 Pierre has been in the construction industry & waterproofing industry since 1974. Aquaseal is a family owned professional waterproofing contractor serving Ontario. To learn more visit Aquaseal on the web.